Hey Coffeeholics, get your wallet ready for next week coz not only is it a holiday on Wednesday, but on the day after that will be the start of one awesome sale event brought to you by SM Accessories. 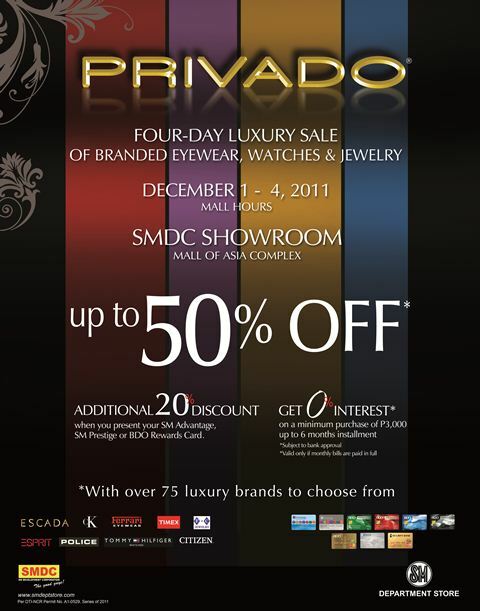 Starting on December 1 up to 4, SM Accessories is having a four-day luxury sale of branded eyewear, watches and jewelry at the SMDC Showroom. The sale event PRIVADO features items from over 75 luxury brands, like D&G, Escada, CK, Guess, Esprit, Rayban, Prada, Tommy Hilfiger, Citizen, Police, Timex and more. Promo is up to 50% off on these great brands. PLUS, an additional 20% discount will be given with your SM Advantage, SM Prestige, or BDO Rewards card. I'm dropping by there on December 1 evening to check this out! This is one sale event that I don't wanna miss! If you are going there at that time, let me know. Maybe we can hang out! :) See you til then. I'll be there sis! haha hope to see you!